Welcome to the Tiger Team's Class Page! Starter for Ten - Is there more future or past? Since returning to school at the beginning of this term, the Tigers have been busy beavering away at two whole-school projects - the Once Upon An Ordinary School Day writing competition and preparations for our Take One Picture gallery (photographs to follow!). They have enjoyed sharing their wonderfully imaginative stories with the rest of the Tigers and are eagerly awaiting the judge's decision! The day that we have all been waiting for (well, the Tiger Team staff anyway - we have been trying to keep it a surprise from the Tigers for over two weeks now!) finally arrived today. They were greeted by a ringmaster and a big 'Roll up, roll up' at the end of morning break and, on returning to the classroom, found themselves in a big top! At the 'King of the Bad Boys' battle with Steven Butler and Francesca Simon in March, Francesca talked about how great writing transports the reader to a new world by creating a 'film' in their mind. We have been exploring the part that powerful description plays in achieving this, which was the focus of our 'big top' experience today. There were 'Senses Splats' around the classroom and the children worked together to build up a bank of powerful words and phrases as they used their senses to interact with the setting. Images of the circus were being explored, Entry of the Gladiator was being listened to, popcorn was being devoured and there were lots of attempts at juggling (some more successful than others and Miss Williams' least successful of all!). Tomorrow, we will be starting to explore a picture book called 'Leon and the Place Between', which will transport us to a very exciting new world ... watch this space for the 'story top hats' that will follow! Well, I said it this afternoon and I'll say it again ... I am TOTALLY lost for words and the Tigers know as well as anybody that that doesn't happen often! I am so proud of you all that I think I might burst! We have been working towards this afternoon's Dragons' Den since half term as part of our Traction Man topic. The Tigers have worked in groups to create a new mission for Traction Man, including designing and making an outfit for him to wear, which they then pitched to a team of Dragons this afternoon. We were very lucky to be joined by our very own Mrs Caswell, as well as the wonderful Mrs Ryan and Mrs Wolpert (also known as Traction Man's biggest fan!) from the University of Cambridge's Faculty of Education. Can you spot the trusty sidekick that they brought with them?! All eight teams pulled out all the stops to impress the judges! They acted out their Traction Man missions, they made everybody laugh, they danced, they sang ... and it was wonderful to see them using so many of the skills that they have worked so hard to develop this half term. Their pitches were certainly very persuasive (the Tigers will probably now tell me that I should have described their pitches as 'amazing' or 'stupendous' to give a better impression!) and they worked together beautifully in their groups. As one of the Dragons commented afterwards, "Your creativity, imagination and collaboration was really inspiring ... it was an incredibly difficult decision to single out just one team for the award because you all did so well." What stars you are, Tigers - you really did sparkle! The Dragons then had the unenviable task of choosing a winner, which didn't happen without a considerable amount of deliberating, cogitating and digesting! Huge congratulations to the 'Awesome Foursome', who were eventually named as the winners! Praise from the Dragons included: "a great persuasive opener with a very clever use of funny lines that made the audience laugh", "the quality and finish of the Traction Man outfit was very simple and very effective", "fantastic story line, very creative and funny" and "great teamwork" ... well done to Sam, Ben, Oli and Ewan - that is praise indeed! Here they are, pictured with the Dragons, their certificates and their authentic Traction Man medals! A huge thank to the Dragons for giving up their afternoons and really entering the spirit of things! Thank you also to all the staff that work with the Tiger Team for their help in getting this show on the road, particularly to Mrs Harris who has worked tirelessly this week to make our vision for Dragons' Den become a reality. Finally, thank you to the terrific Tiger Team for doing yourselves and all of us proud Check the class stars board tomorrow morning! Here are some highlights from the past fortnight in the Tiger Team! Congratulations to the whole Tiger Team for winning Reading Stars this week - the latest Skullduggery Pleasant book will be arriving on our bookshelf next week! The names of all the children who were awarded a Reading Star this week were put into a draw to win two complimentary tickets to 'Steve Cole and Sarah McIntyre: Comic Capers', another event organised by Just Imagine Story Centre as part of Essex Book Festival. Well done to Millie Livesey and Hannah Wallace - here they are joining in with the fun and having their new books signed by Steve and Sarah! This is the link to Sarah McIntyre's blog post about the afternoon - see if you can spot Millie and Hannah! Last week was our whole-school Book Week. We had great fun and laughed a lot together reading 'How to Train Your Dragon' by Cressida Cowell, who was our chosen author for the week. Happy Book Week 2014 from the Tiger Team! Dragons' Den is just around the corner and things are certainly hotting up! The Tigers have been working extremely hard in their groups to design a new outfit for Traction Man to wear on his latest adventure. They have been concentrating on working with accuracy and precision to achieve a fabulous finish this week ... we know that only the best will impress the Dragons! This afternoon heralded one of the biggest battles that the world of children's books has ever seen! Organised by Just Imagine Story Centre (www.justimaginestorycentre.co.uk), it was certainly a case of 'double trouble' as authors Steven Butler (Dennis the Menace) and Francesca Simon (Horrid Henry) battled it out to try to earn their character the title 'King of the Bad Boys'! It was so lovely to see so many of the Tigers (and a Dolphin, a Butterfly, a Snow Leopard and a Lion!) there - what fantastic fun we had! We heard Francesca and Steve read extracts of 'menacing mayhem' from their books and it was a hard-fought battle as both tried to convince us that their character is naughtier. We laughed a lot! It was then down to the audience to decide who should be crowned the naughtiest boy in children's books and we raised the roof as we cheered on our winner ... if the cheers in the St. Andrew's camp were anything to go by, Dennis the Menace was the right winner! We enjoyed meeting the authors to have our books signed at the end of the afternoon - these photos show Libby and Marshall talking to Francesca Simon! Don't worry if you couldn't come, Tigers - I've got us our own class copy! Thank you to the parents of all the children who came for bringing them and to Just Imagine for organising another fantastic event - do visit their website or ask me for details of other exciting book events that they have coming up! We have reached the end of another glorious day! We decided in Tiger Team that we should definitely be making the most of the weather so we ventured outside onto the field for PSHE and Story Time this afternoon. Here are some photographs of us enjoying our current class story, 'Operation Bunny' by Sally Gardner, in the sunshine! I hope you've all managed to enjoy the sunshine this weekend - let's hope that it is here to stay! I have just been talking to Nikki Gamble, who is Director of Just Imagine Story Centre in Chelmsford, and she has drawn my attention to an event that is happening in Colchester next Sunday (16th March) as part of Essex Book Festival. I know that we have lots of Horrid Henry fans and Dennis the Menace fans in the Tiger Team - here is your chance to listen to the authors talk and have your books signed! I'm really excited! I'll tell you more about it this week but you can click on the picture below if you can't wait to find out more! The Tiger Team's creative juices were certainly flowing during our Big Write on Thursday! From pulling Polly Lolly to safety from Evil Professor Candy Floss at the theme park to saving the drawings from Master Sharp Scissors, Traction Man saved the day thirty two more times! 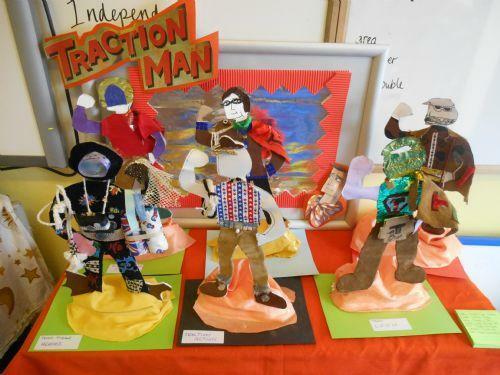 Hurrah for Traction Man! "The most exciting part was when Traction Man got saved by the dog" - Anonymous! Welcome back to the second half of the Spring Term ... and to our new topic in the Tiger Team! The huge cheer that I was met with when I told the Tigers that our new topic is 'Traction Man is Here!' would suggest that they are as excited about it as I am (we read it in Guided Reading last October and I have heard them talking about it countless times ever since!). This afternoon, we kicked off the topic by reading 'Traction Man is Here' as a class - the photos show just how much we enjoyed it! We discussed the villains in the story and the Tigers then had great fun creating their own - Daring Doctor Oven Glove, Menacing Mr Rubber, Poisonous Bobby the Bubbling Toilet, Horrifying Doctor Pavestone and Terrifying Mr Pork Chops (a piggy bank!). Can you guess what the setting for each of these adventures might be?! They will be developing these further as we work towards our very own Dragon's Den ... watch this space! It hardly seems possible that this half term is already over! Here are a couple of the highlights of the last fortnight. The Tigers enjoyed finishing their planet colleges (see post below for the first part!) and lots of other teachers have commented on how effective they look on display. Great work, Tigers! Millie amazed us with her attention to detail and style and ended up doing a 'Millie's Masterclass' for the rest of the Tigers! We rounded off our 'To Infinity and Beyond' topic with a trip to the Science Museum during the last week of the half term. The Tigers were a real credit to St. Andrew's and their behaviour throughout the day was exemplary - they should be very proud of themselves. We enjoyed a 3D 'Fly Me to the Moon' film in the IMAX cinema, had a workshop with Gene Cernan (the last man on the moon!) and spent the afternoon exploring the 'Space' gallery. The children's enthusiasm was wonderful to see - I couldn't keep up with all the different things they had found out that they wanted to tell me about! Two of the Tigers are busy writing a blog post about their favourite part of the day - keep checking back! What a busy fortnight we have had in Year 5 since the last update! We are really enjoying our current 'To Infinity and Beyond' topic; the Tigers are definitely showing 'awe and wonder' (one of our school learning behaviours!) and asking some brilliant questions. The Tigers are ready to begin writing their science-fiction stories in Literacy next week after lots of 'daydream time', discussion and planning. We now have a very sparkly 'To Infinity and Beyond' display, thanks to Mrs. Harris and a very creative group of Tigers! We have been adding lots of 'wow' words and phrases that they are magpie-ing for their own writing. We have spent a lot of time exploring the solar system outdoors. We recreated the solar system using various pieces of fruit and three rolls of toilet paper to help us understand the relative sizes of and distances between the planets. Each square of toilet paper represented 16 million miles! Once we had created our perfectly-to-scale solar system, we could easily see that the four planets closest to the Sun are much closer together and smaller than the four planets furthest away from the Sun. We decided that there isn't a piece of fruit big enough to represent the Sun - we learnt that it is one million times bigger than the Earth and we couldn't think of a piece of fruit one million times bigger than a cherry tomato! … then we added the Moon! Ben J (the Moon) had to orbit Abi and Charlotte (the Earth) whilst they rotated it on its axis and orbited the Sun (Ben S-H, Jack and Josie), who stayed still! Can you work out who is the Sun, who is the Earth and who is the Moon in these photographs?! 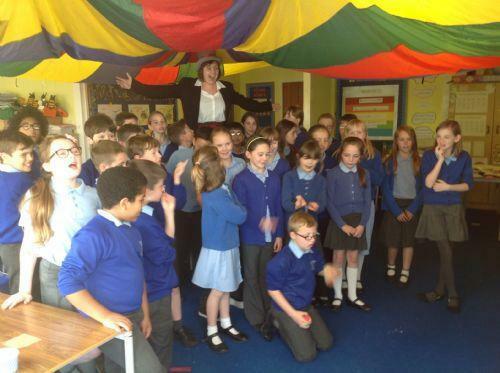 This week, we had an art, music and science lesson linked to the planets all in one! We explored the abstract paintings of Jackson Pollock, before the Tigers each created four mini abstract paintings inspired by four movements from Gustav Holst's 'The Planets' - Jupiter, Mars, Saturn and Venus. I only played each movement for about three minutes and the Tigers painted spontaneously as they listened to the music, thinking about what colours and patterns they could hear. We will be cutting the paintings apart and creating planet collages next week - watch this space! The Tigers have had a fantastic first week back at school after the Christmas break; Mrs. Harris, Mrs. Roche and I have been so impressed by how quickly they have settled back down to work. Our topic for this half term is 'To Infinity and Beyond'. The children will be writing their own science-fiction stories in Literacy and we have had great fun exploring a short story about an alien landing this week. We imagined that we were the main characters in the story and hot-seated them to help us to empathise with them. The Tigers worked hard to develop their questioning skills, and Ellie and Sam did an amazing job in role as the main characters answering all the questions! We finished the week by writing eyewitness accounts of the sighting during our Big Writing this morning - moon candles, music and lots of magical writing! Congratulations to this week's Writing Goal Scorers! Autumn Term finished today at the end of an extremely busy week - after the Christmas pantomime, Carol Service, Christmas lunch, a very sparkly 'Tigers Got Talent' and the candlelight service this afternoon, we are well and truly ready for Christmas! Thank you, Tigers, for all your hard work and enthusiasm this term - what stars you are! Have a great Christmas! The Tigers knew that the day they had all been waiting for had finally arrived when I appeared carrying vast quantities of Diet Coke and Mentos this morning ... volcano eruption day!! I have run out of superlatives to describe just how brilliant the team of star volcanologists were, once again, this afternoon. Despite unprecedented levels of excitement, they could not have listened more carefully to instructions and, as a result, every single volcano erupted. You made me feel very proud, Tigers! I don't think I need to say any more about unprecedented levels of excitement - the expressions on the children's faces in the photographs say it all! Mount Victor the Volcano (the biggest papier mâché volcano we have ever seen!) even impressed Miss Eade and the Zebras, who came out to watch too! We have been busy painting our volcanoes in the Tiger Team this afternoon - lots of brightly coloured paint and lots of fun! They are now all ready to erupt at the beginning of next week! Meanwhile, India, Jervaise, Kia, Millie and Oli F were busy making the biggest papier mache volcano I have ever seen with Mrs Harris! Let's hope that the eruption is just as spectacular! WOW! Tigers (and Tigers' parents!) - what a wonderful afternoon we have just had Learning Together! Your creativity, perseverance and the way that you worked together so well have left me speechless, and we all know that that doesn't happen very often! I am so impressed by your volcanoes - I can't wait until we can paint them once they are dry and erupt them! Well done to every single one of you for all your effort this afternoon. You have made Mrs Harris and myself very proud of our team of star volcanologists, and you should be very proud of yourselves too! Have a look at the Class Stars board tomorrow morning ... you might just find that we're one star closer to 'Tigers Got Talent!'. Exciting news that I can't wait until Monday to tell you! 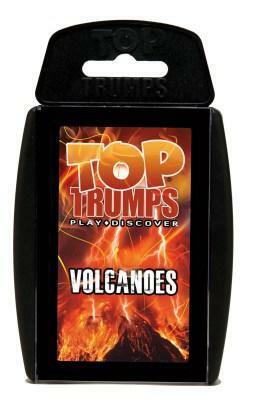 Dr Barclay has been on the team that has just designed the brand new VOLCANOES TOP TRUMPS! I have just ordered a pack for you, but you can have a look at the Volcanoes Top Trumps website in the meantime for lots of exciting volcano facts and a new online game! Clicking on the Top Trumps below will take you through! Star Volcanologists during Topic next week will be the first to play with our cards once they have arrived! Happy weekend, Tiger Team! We have been doing Big Maths ... Beat That! every Friday to practise quick recall of addition and multiplication facts. I have uploaded a practice grid, which is at the bottom of the page under 'Documents'. The Tigers only have 100 seconds to answer as many as they can ... they know that they need to practise as much as they can to beat their high score each week! I am happy to print practice grids off at school for anybody who would like me to. I have also added a link to a website where you can practise your addition and multiplication facts against the clock at the bottom of the page - are you a Math-Magician?! Enjoy the rest of the weekend - see you on Monday! Our topic for this half term, chosen by the children, is Volcanoes. I am sure we are going to have a blast! The Tiger Team have just received an email from a volcanologist at the University of East Anglia! She has given our mini-volcanologists a challenge that they seem to be very keen to rise to! Many of them asked whether they could begin the challenge at home before our next Topic lesson, so I promised to add a copy of the email to our class page. Lots of the world's islands are built up because they are volcanoes. I challenge you to find ten islands thave have a volcano or lots of volcanoes on them! They can be anywhere! Then, I want you to tell me where each of these ten volcanoes sit on the Earth's tectonic plates: are they in the middle of their plate, or near the edge? Can you tell me about the name of the plate that they are on? Try to choose islands as widely scattered around the world you can. When you have done that, next week I will tell you something about each of those islands and their volcanoes and you will choose two of them for you to investigate more! Good luck -- and I look forward to hearing from you! I have uploaded the times tables practice grids to our class page. Scroll down to the bottom of this page and you will find them under 'Documents'. Find the grid that you are working on at the moment and practise as much as you can over half term. Remember to stick completed grids in the back of your Numeracy book when we are back at school! Reading Stars will continue after half term. Try to read to an adult at home and ask them to sign your Reading Record at least three times to earn a Reading Star for the Tiger Team! Congratulations to our Writing Goal Scorers of the week, who all used some wonderful description in their versions of The Tiger Who Came to Tea! See if you can spot the rainbow red powerful adjectives, rainbow orange powerful verbs and rainbow yellow adverbs in their sentences. Stamps will be awarded to those of you who come and tell me! We had our first Learning Together session this afternoon and we were thrilled that so many parents, grandparents and friends were able to come along. Everybody worked so well together to create some wonderfully creative Caribbean carnival masks. It was a lovely way to round off our Black History Month/Marshall Taylor topic and a very sparkly end to the first half term in the Tiger Team! Well done Tigers for putting in so much effort to read to an adult and get your Reading Records signed three times. We won KS2 Reading Stars this week for the second time! Our new book will be on the bookshelf at the beginning of next half term Keep it up! Last week, the Tiger Team earned their twentieth class star for working together so brilliantly. The children decided at the beginning of term that they would like a pyjama party for their treat, which we thoroughly enjoyed on Tuesday afternoon. Mrs. Harris made us some amazing cupcakes! How many little tigers can you spot?! 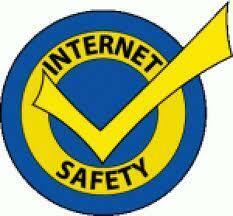 How safe is your internet searching?